Commenting on Chancellor Angela Merkel's tour of the Balkans, business newspaper Deutsche Wirtschafts Nachrichten (DWN) lamented that despite the serious problems faced by the European Union over Greece, Merkel is sticking to promises of EU membership for Serbia and Albania, "in order to prevent them from coming under the influence of Russia." 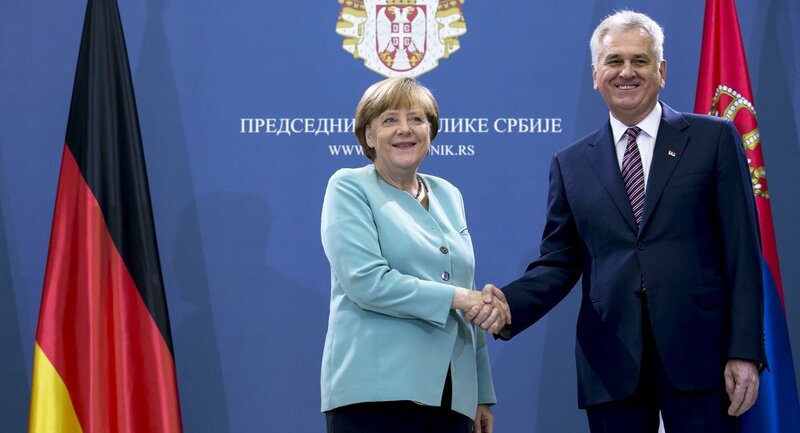 "As if the EU did not have enough problems, Angela Merkel made promises for Albania and Serbia's accession to the EU," the newspaper noted on Thursday, on the eve of the wrap-up of the Chancellor's tour of Albania, Serbia and Bosnia. On Wednesday in Tirana, Albania, Merkel promised that there would be no artificial delays in the Albanian and Serbian drive for membership in the supranational bloc. "I can tell you, nothing will be artificially delayed. There won't be any difficulties constructed," Merkel noted, adding that the countries' EU entry is related to the union's credibility. DWN argues that the Chancellor's growing attention toward the Balkan region can be explained by the fact that "countries such as Russia, Turkey and Saudi Arabia are trying to gain influence in the region." The newspaper is wary of Merkel's promises, noting that "experience shows that the inclusion of new countries into the European Union for geopolitical reasons often comes at a tremendous cost: Greece also became a member of the EU at the insistence of the United States. The experience has not turned out particularly favorably." DWN noted that as with the case of Greece prior to its entry, accounting of the statistical data provided by Serbia and Albania remains poor, and both countries are still very far from reaching EU standards in a number of areas. The paper also warned that regional corruption threatens to turn EU projects into a financial black hole. In addition to Greece, other Balkan nations to have been granted EU membership include Slovenia, Croatia, Romania and Bulgaria. Serbia and Albania are presently candidates for membership, but accession talks have not yet begun. German media reporting on the Chancellor's visit to the region have noted that apart from economic issues, the two countries also have problems of ethnic strife and territorial conflicts, which could hamper their ambitions to join the EU. In Serbia's case, this includes the continuing refusal to accept the independence of its southern region of Kosovo, which broke off and was given recognition by Western countries following a NATO bombing campaign in 1999.